In it's 2nd year of production unchanged, New Balance is sticking with a great formula for Leadville v3. The v3 is in my opinion, one of the most reliably comfortable, cushioned, stable, protective distance shoes on the market. The Leadville v3 dual layer Fantom Fit seamless synthetic mesh upper consists of a web of welded overlays, offering a nice balance of having a comfortable, yet securely locked down feel, excellent breathability and rugged durability. The Leadville v3 has a durable rand around most of the shoe, culminating with the wrap around rubberized Toe Protect toe bumper that is semi pliable and quite protective. The tongue is on the thin side, even more thin around the edges and is a bit shorter than I like. It is gusseted, but I find it somewhat difficult to determine if I have the tongue properly positioned or not, as the thin edges of the tongue fold in funny ways. It is usually OK, but I find myself fishing my fingers around trying to make sure the tongue is laying properly before I tie the laces. Not a huge deal, but can be slightly annoying when in a hurry (which I often am). The heel collar is an ideal height and very well padded, where the shape and density of the padding give secure and comfortable locked down heel hold. The heel counter is thick and protective without feeling bulky, puffy or overbuilt. There are 7 sets of punched lace eyelets which integrate very well with the sausage link laces. Perfect snugness is achieved on the first try and I never have to re-adjust at any point. In my opinion, laces/lacing does not get better than this. Fit is true to size, but slightly on the roomy side. I think most will find the forefoot fit to be accommodating to wide variety of feet and satisfy those who prefer a bit of room stretch out. Somehow this is achieved without compromising foothold, security or stability. Breathability is average and though there are shoes out there that are more airy, I never had any issues with my feet being too hot. The Revlite midsole is on the slightly firm side, but is very well cushioned and forgiving. Though not a speedster, I have found that the Leadville v3 can handle just about anything I can throw at it, great on long runs, but very competent on faster, shorter tempo runs on just about any technical terrain. Even the insole pays homage to its namesake. The outsole is made up of Vibram rubber with an array of moderately deep lugs of various shape for multi-directional traction. Traction is very good in a wide variety of conditions, be it dry trail, rocks, technical terrain, wet, dry, snow, mud, etc... Though it performs very well in a wide variety of conditions, I find it to be slightly better suited to dry conditions. 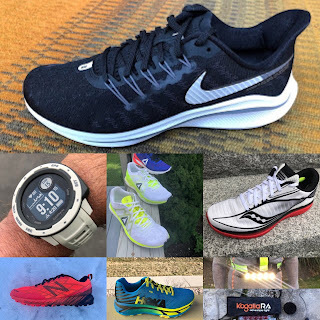 Durability of the outsole is excellent, as I have noticed very little wear over the course of about 50 miles on mostly rough and rocky terrain. Considering the high level of protection, plush cushion, secure/protective upper and traction with a reasonable weight, the Leadville v3 is in my opinion, one of the finer long distance shoes on the market. The v3 performs well at just about any speed and is surprisingly responsive, quick and agile without much provocation. Whether I am planning a fast, hour long run on just about any terrain, or an all day long run, the Leadville v3 is on my top shelf of 1st choice shoes. Stability and control are excellent, ground feel is very good, the upper is comfortable and accommodating, yet has very secure foothold that greatly contributes to it's high level of performance, even in technical terrain. 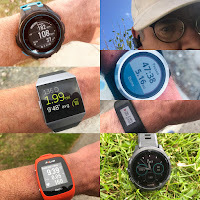 Performance on the road is good, so can easily double as a door to trail shoe without much difficulty, but performs much better as it is intended on the trails. Underfoot protection is great on rocky terrain, with the plush cushion and rock plate muting even the hardest hits on pointed rocks. Flexibility and contouring is very good too, with sufficient trail feel and no tippy feel. I would recommend the Leadville v3 to anyone looking for an all day trail trainer/racer for a wide variety of terrain, those looking for a more accommodating, yet secure fit, requiring durability and for anyone looking for just one shoe to cover most of their needs. Not to mention, at $124.99 retail, now heavily discounted at various retailers, the Leadville v3 is a great value. -.01 for weight. This is almost an unfair deduction because the v3 offers so much for the weight, but my size 10 is tipping the scales at 11oz., so is getting closer to the heavy side. New Balance Leadville v3 vs. New Balance Hierro v3 (RTR review here): Both shoes feel very similar to me in terms of weight, response, cushion, protection, traction and secure upper with some wiggle room. I think the Leadville feels slighly more nimble and performance oriented and would pick it over the Hierro v2 if racing or if spending time on rocky terrain. I also find the Revlite midsole of the Leadville v3 to maintain it's properties longer than the Fresh Foam used in the Hierro v2. New Balance Leadville v3 vs. Topo Athletic Terraventure (RTR review here): Very close in weight, traction, versatility and trail feel. Both have a more generous forefoot fit to accommodate a wider variety of foot shapes and appeal to those looking for a bit more room for splay/swell, while still retaining a stable feeling upper. New Balance Leadville v3 vs. La Sportiva Akasha (RTR review here): The Akasha is about an ounce heavier, but they both feel similar in weight on the foot. Cushion is very similar. The Akasha has better traction overall, particularly in wet conditions and is a bit more agile and nimble, particularly evident when running fast in technical terrain. New Balance Leadville v3 vs Saucony Xodus ISO (RTR review here): These two are close in weight and have the same amount of cushion. The Xodus also has deeper lugs, is better for snow and mud, but overall traction is similar. The Leadville v3 can better handle speed as it is more responsive, is more stable in technical terrain with a more secure upper and stable platform. The Leadville v3 is also a better door to trail shoe. New Balance Leadville v3 vs. Brooks Caldera (RTR review here): The Caldera is about an ounce and a half lighter, is similarly responsive, but cushioning and fit feel very similar. The Leadville v3 has better traction overall, with a more durable outsole. The Leadville was provided at no charge. The opinions herein are entirely the author's. Any thoughts on how it compare to the Vazee Summit 2? I really like the tongue on the Summit, but the Vibram outsole on the Leadville seems like a nice upgrade. Fantastic shoe. Trialed over flat/ firm terrain, rocky and muddy steep trails going uphill and down. Comfortable. Arch support minimal but perfect and well-positioned for me.